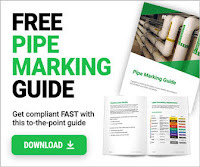 How can you recognize a failure in a piping system? Ratings for above ground metallic systems are generally governed by their joints. Frequently these are flanged joints manufactured in accordance with ASME B16.1 (iron flanges) and ASME B16.5 (other metallic flanges). Ratings for flanges (and some other piping components) are designated by pressure class. FOR MORE INFO, SEE THE EMBEDDED PDF. GIVE IT A MINUTE TO LOAD.